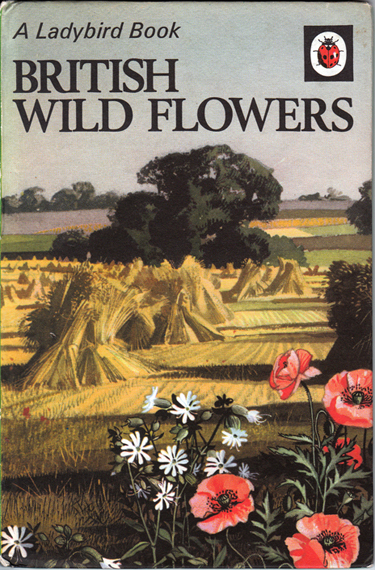 Description: A beautiful little book, describing over 70 species of wild flower found in Britain, from common varieties like the foxglove and bluebell to rarer ones such as the bugless viper and horned poppy. Each variety is described concisely, and includes information about where it can be found and the months in which it is in bloom. Illustrated with enchanting full-page, oil paintings on every facing page, plus miniature blue monochrome reproductions with each flower labelled. Matt pictorial boards. Front cover is in excellent condition; rear has some rubbing along its lower extremity, plus further rubbing and scratches just above. Spine bumped and lightly rubbed along edges. Upper corners only slightly bumped; lower are straight. Apart from a minor grubby mark on page 12, the book is in mint internal condition. Although the copyright date given is 1957, this reprint dates from c.1975. Measures 17.5 cm × 11.5 cm (7″ × 4.6″). 12mo. 51 pp. + index.